Anyone who has worked in an office would be familiar with the seemingly lifeless 9 to 5 routine. That stress and sedentarism is often considered bad for health and creativity for obvious reasons. Working from home eases the gridlock and brings some balance back into your life. However, a lot of people tend to fall off the eco-friendly wagon when designing the home office. So, why not take a creative step forward to conserve energy and utilize even the smallest of space to create an eco-friendly workspace? Good lightning is an essential part of an office. If you are going to spend a lot of time in the space, and the structure of your home allows for it, installing an energy-efficient skylight is a smart option. 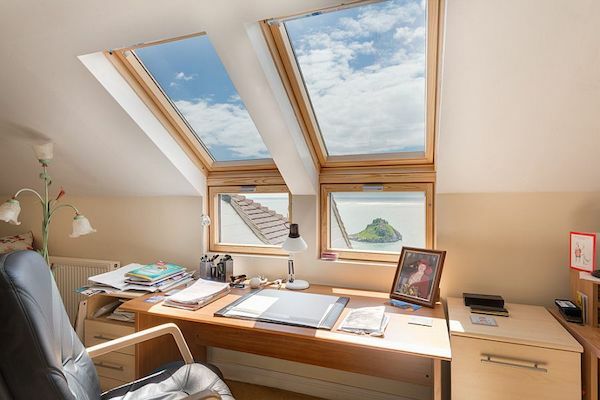 You’ll infuse the room with natural daylight while cutting down on electricity costs. Just be sure to actually head outdoors at some point in your day, too. Vitamin D does the body (and your productivity) good! 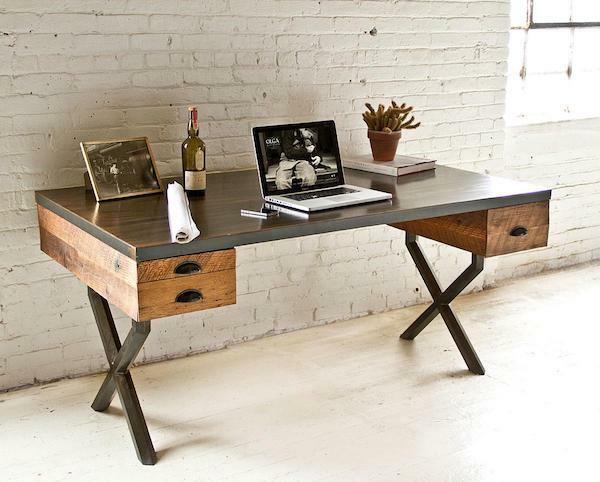 Take responsibility for your home office’s environmental impact by considering eco-friendly furniture. A reclaimed wood desk, cork stool, or chairs made of recycled plastic can all contribute to your efforts to make the workspace as eco-friendly as it is efficient. You can also shop your home and give new life to bookshelves or cabinets that are simply collecting dust in the back of a closet. Nothing beats bringing the great outdoors inside. Placing plants around your home office can improve air quality, decrease stress, and create a more peaceful environment, which are all important when you’re working on a deadline. Incorporate greenery in the form of breathtaking terrariums, hanging planters, a miniature herb garden, or simple potted plants (English Ivy is an office favorite: It filters chemicals from the air). 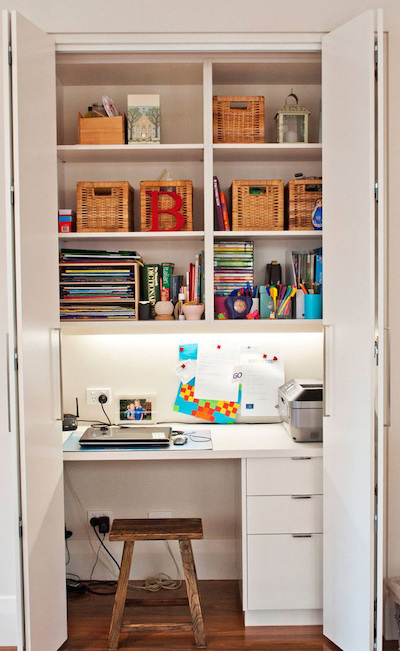 If all of Narnia can hide inside an old closet, so can your home office. When you’re tight on space but your daily to-do list is overflowing, a spare closet is the perfect place to secretly tuck away your work area. Measure the closet to make sure you find a desk or other work surface that fits, add some chic desk organization tools, and slide in a slim office chair or stool. When your workday is done, simply close the closet doors. You can get the big jobs taken care of without creating a big footprint to match. You’ve heard it a thousand times: When looking for new ways to organize, look up! Utilizing your walls to create more storage space just makes sense. Buying brand new shelves, however, doesn’t. 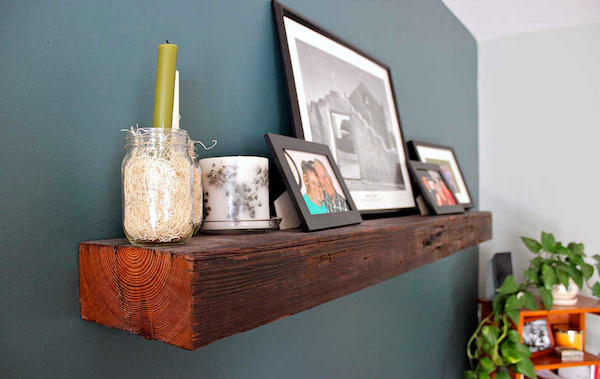 Instead, install recycled, reclaimed, or salvaged wood panels. You’ll create a unique, rustic look that boasts the added bonus of being good for the environment (when properly sourced, of course). With a little touch of creativity, these shelves can be gussied up to further help declutter your desk by holding extra office supplies, documents, books, and more, leaving the surface of your space clear for, you know, work. Creating an eco-friendly office shouldn’t mean more difficult tasks. Some quick research, selective purchases, and a keen eye taken to items you already own can infuse your area with style while being good to the environment. This post was written by Tom Jennings, a freelance writer at Primero who is binging on Netflix series and food when not expelling some wisdom. Catch his words, he loves playing with them.